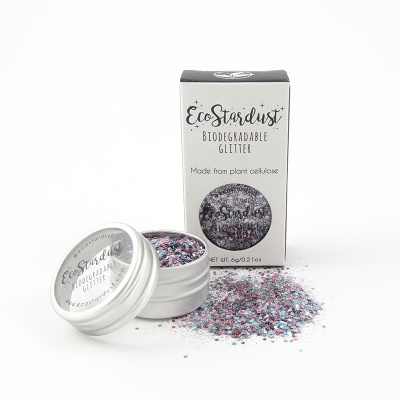 Biodegradable glitter made from sustainably farmed non-GMO plant cellulose. Premium grade cosmetic glitter, suitable for use on the face, body and hair. It can also be used in craft projects. Marine and wastewater safe. Vegan and not tested on animals. Made in the UK. 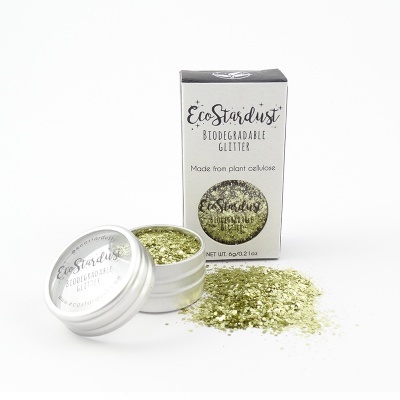 This biodegradable glitter is made predominantly from non-GMO Eucalyptus Trees which have been sustainably farmed. It still has the same reflective properties as conventional glitter and is made with the same precision cutting techniques however it is much better for the environment. 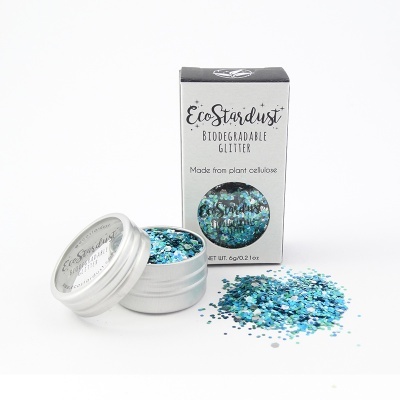 This plastic-free glitter has been created to marine and wastewater safe standards. Conventional glitter is made from plastic which can sometimes contain harsh chemicals which you don't really want to be putting on your skin. If you wash this down the drain it will likely end up in the sea. 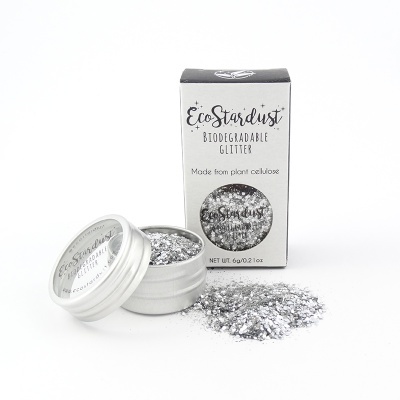 By using this plastic-free glitter is will help prevent microplastics from entering our oceans. 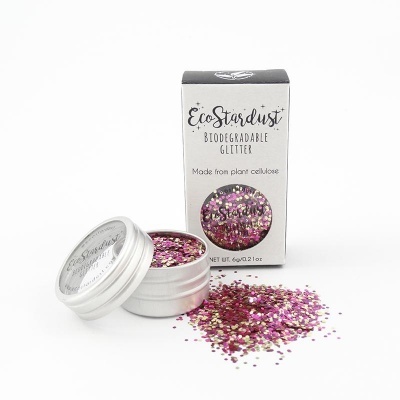 This premium grade cosmetic glitter feels soft and is much more delicate on the skin. It is cosmetic grade so suitable for use on the face, body and hair, however, it can also be used in craft projects if you wish. There are many ways to apply biodegradable glitter. Just pop something like coconut oil, aloe vera gel, shea butter or un-petroleum jelly on wherever you want the glitter to stick and then dab the glitter on top. To remove, simply wash away with warm water and soap, or use your normal makeup remover. Not recommended for use around the eyes. Cosmetic Eco-Glitter is a biodegradable glitter range produced from cosmetically approved ingredients. Produced from a special biodegradable film which is derived from sustainable and environmentally sourced raw materials. It does not contain genetically modified ingredients or materials obtained from genetically modified organisms. The heavy metal content of Eco-Glitter is very low and fully complies with cosmetic requirements. It has the added benefit of being antimony-free as no antimony is used in the production process. (Eco-Glitter also satisfies EN71-3: 2013 A1: 2014 and EN71-2: 2011 for the safety of toys). Packed in a recyclable and reusable metal tin, the window is made of recyclable PET. The card is made from recycled paper. Made by a team of eco-conscious festival goers who are crazy about glitter and passionate about the environment. 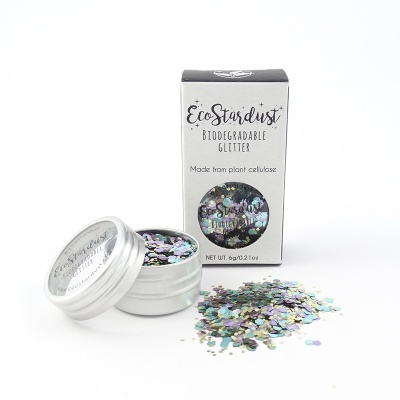 However, once they realised they were covering themselves and the world in little bits of plastic it took the sparkle out of it, therefore they started their mission to find an alternative and this is how EcoStardust Biodegradable Glitter came about. 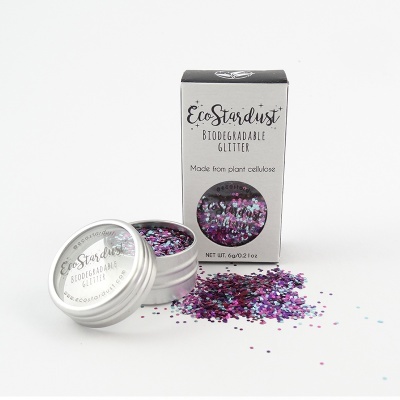 They launched in April 2017 and headed straight out to UK Festivals to start spreading the word about Eco-Glitter!